As one of gaming's most iconic mammals, Sonic the Hedgehog needs no introduction; he's graced consoles, comic books, crossovers and clothing lines in his double-decade career, and this is where it all began. Well, nearly — Sonic the Hedgehog on the Game Gear isn't a port of the Mega Drive / Genesis classic, but rather of the 8-bit remake for the Sega Master System which was released following the success of the 16-bit original. The result is a wonderful portable platformer with a distinct identity from its console cousins; it might be bite-sized, but it's a whole lot of fun. Even in this early outing, the Sonic formula as we know it today is alive and well: Sonic speeds through six zones of two stages and a boss battle each, looking for Chaos Emeralds — now hidden in the levels themselves — along the way. If you finish a stage with at least fifty rings in tow, you'll be transported to a Special Stage where Sonic can bounce around in a springy, ring-filled wonderland, stocking up on the life-giving loops before the next level. Sonic's moveset is limited, but not limiting; he can run, jump, and roll into a ball, and by combining those three simple actions, players can do quite a lot with the humble hedgehog. Running and rolling takes considerably more skill to pull off than the Spin Dash introduced in later Sonic games, but it's also a lot more satisfying. The controls are tight and precise — a necessity given the tiny platforms Sonic navigates here — and the Circle Pad feels especially well suited to the action. Veterans of the Mega Drive original will notice some substantial differences in the levels of this version: the new Bridge and Jungle Zones stand alongside three returning zones (in modified form), and there's a redesigned final stage as well. Whatever the reasons behind the stage-swaps, these changes are far from a downgrade — in fact, the 8-bit exclusive zones are among the best in the game, and bring welcome new gameplay ideas like forced scrolling and a vertically-oriented climbing stage. In every zone, level design is top-notch and streamlined for the small screen, with multiple paths to explore and a good balance between thrilling speed and precision platforming. The stages are a big part of what makes Sonic games so much fun to play, and this one is an excellent example. The only letdown lies in the underwater sections, which are miserable, stressful slogs thanks to Sonic's glacial swimming speed and seriously subpar breath-holding skills. Thankfully, these make up a very small portion of the game. Redesigned levels aren't the only difference from Sonic the Hedgehog's console counterpart, of course, and there are a few tweaks to the gameplay as a result of its new handheld hardware as well. The biggest change is that Sonic can't reclaim any rings dropped after running into an enemy. It would've been a big ask for the Game Gear to display dozens of transparent ring sprites all at once, so you simply roll back to zero every time you take a hit. During boss battles, meanwhile, you can't use any rings at all — Sonic expires after a single strike in his encounters with Eggman, and they're much more demanding as a result. There's also plenty of slowdown when the screen gets crowded, especially with falling platforms. It certainly doesn't ruin the game, and felt par for the course back in 1991, but players accustomed to a more consistently speedy Sonic will find it jarring. Framerate dips aside, Sonic looks great on the Game Gear. The hedgehog wears his 8-bit colours very well, with a simple, colourful style that's full of retro charm. Later Game Gear titles would add more detailed sprites and busier backgrounds, but to our eyes, the clean lines and bright colours of this first release have aged much more gracefully. Likewise, Yuzo Koshiro's original soundtrack is a timeless chiptune classic, from the familiar opening notes of Green Hill Zone to the sublime Special Stage song. 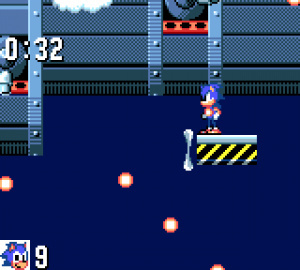 Sonic's first 8-bit adventure is also the only place to hear the phenomenal Bridge Zone track — one of the most memorable melodies in the series' 22-year history, and one that fans will recognize as the basis for Tails' theme in Sonic Adventure. As always, Sega's excellent Virtual Console amenities round out the retro package with a generous coat of modern polish. Along with restore points, you'll find fully customisable controls and a bevy of display options, including a lovingly detailed Game Gear frame that comes in four different colours. You can even recreate the blur effect of the handheld's battery-guzzling screen, if you're after the authentic early-90's experience. Perhaps as a concession to the original hardware's notoriously brief battery life, Sonic the Hedgehog is quite a short game by modern standards — you can easily run from start to finish in a couple of hours, and well under that if you know what you're doing. It's short, but it's sweet, and the search for the six Chaos Emeralds certainly adds some replay value. 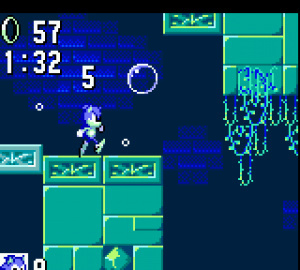 The Game Gear version of Sonic's first adventure isn't just a competent conversion of a legendary game — it's also a fantastic platformer on its own merits, with tight controls, a great sense of speed and plenty of personality. Players with fond memories of the Mega Drive version will find fresh surprises alongside the nostalgia trip, and for first-timers, the excellent 8-bit exclusive zones and soundtrack make this just as easy to recommend as its big-screen sibling — and well worth a double dip. The series might have expanded onwards and upwards over the last twenty years, but there's a real joy to Sonic the Hedgehog that hasn't diminished with age. This is the Blue Blur at his basic best: a speedy, smile-inducing classic. I used to play this ALOT, more than the original Sonic. Looking forward to revive my childhood nostalgia! I must be very biased, because I didn't enjoy this one, and I enjoy most Sonic games. I'll get those game Gear games next time I get an eShop card. Yep, I got it Thursday and played it for a bit and enjoyed it, lately I don't play games much but I played this a bit longer. This is going to be my first Sonic, what a better place to start than the beginning? I actually own this game on my beloved Sega Master System and love it to death. Still haven't beaten it, as most of my controller's buttons are broken, sans Left/Right and A. Anyone know a fix for that? Loved it as a kid and still do now Frame rate is slightly annoying but still a great game! 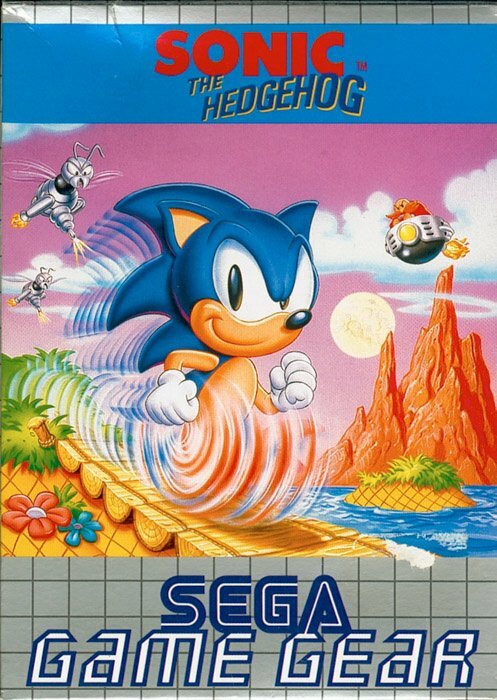 8-bit Sonic 1 is the only 8-bit sonic I would consider able to rival the Mega Drive games. 8-bit Sonic 2 was counter-intuitive, cheap, and not all that fun. Sonic Chaos was really underwhelming and short. Sonic Triple Trouble was okay but not all that great. And Sonic Blast was UNSPEAKABLY bad in almost every regard. So Sonic 1 is the only 8-bit Sonic I would heartily recommend! Tails wasn't introduced yet when this game was made. Your review of Sonic 2 is very subjective. To this day, I much prefer Sonic 2 over Sonic 1. I do feel it was rushed or not cared for to some degree, but take into account by 1992, most people had Mega Drives and it was Sega's flagship console. @XavandSo, wait, are we talking about 8-bit or 16-bit Sonic 2? 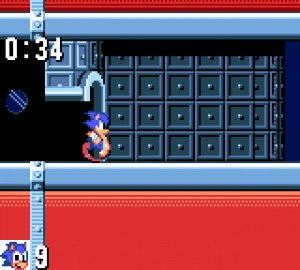 I LOVE 16-bit Mega Drive Sonic 2. I was referring to Game Gear/Master System Sonic 2, the one with the ridiculous hang glider and a level named "Gimmick Mountain Zone". The Master System/Game Gear version. I never owned a Mega Drive, I switched to SNES in 1994. Under Ground Zone's boss is too luck-based. On the Game Gear, you can hardly see around you giving you even less time to react to the bouncy balls of instant death. 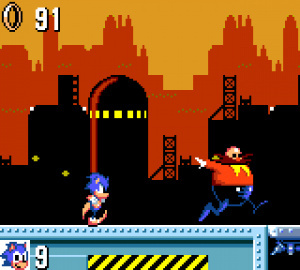 The way Eggman rushes you at the end of the fight is just cheap too. Sky High Zone is such a short level, but has one of the hardest gaps to jump across with the ridiculous hang glider. I guarantee that anyone who plays this will fall and fall and fall into that gap. Act 2 is better, but it's weird how you can't tell when a cloud is solid or when a cloud is just scenery. Sometimes only half of a cloud is solid. Why is it not distinct? 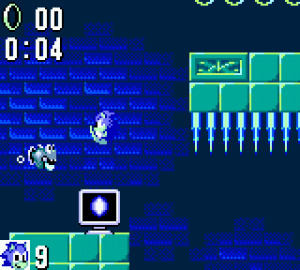 Aqua Lake zone is annoying in itself for being the underwater stage, but the boss really drove me mad. He demonstrates to the player how to beat it by hurting himself once, by bouncing his ball up, it lands on him and he gets hurt. Except when Sonic touches the ball, it kills you. I had to look at a video to realise that you have to hit him while he's CREATING the ball, not when he THROWS it, completely contradicting the demonstration. That's just unacceptable. And if you reach the final stage having missed just any one of the emeralds? Too bad, you don't get to play the final stage. WTF. All those things could be overcome by learning the game, remember games, especially platformers from that era had to be challenging to be worth that $50. That said like Sonic 1 though, I never finished Sonic 2. Also; speaking for the MS version, Sega wanted to usher in people into the Mega Drive, so making people fed up with old tech limitations with their version of Sonic 2, was a perfect selling point for the 16bit Sonic 2. I love this game, its one of the only Sonic games I've played which I actually like (along with Adventure, Colours and Generations). Will definitely be picking this up. But I fully agree with everything @EarthboundBenjy said, Sonic 2 MS/GG is just a really bad game. Along what he said; no special stages, horrible level design, Tails DIES if you don't get the Chaos Emeralds, the Emeralds are hidden in the most idiotic places. I don't see any redeeming factors with that game. I thought NL was going to trash this game but it didn't. I personaly love this game. The music is awesome and it stands out from the original Genesis version. Really? I thought that to but the more I played it, the more I came to love it. Better than the Mega Drive version. I WISH i could "get into" Sonic fully...i've tried dozens of times. i think its because of the imprecise nature of the gameplay, or loose feel it has. Not sure. I have enjoyed some of his titles, but overall no. I'll keep trying when Sonic Lost World comes out. Just bought the game and played through it, and I can safely say the Game Gear version is better than the Master System version. Some of my minor gripes about the level design of the MS version have been removed (particularly Jungle 2, which no longer kills you if you try to jump on a platform you have already passed). The special stages are changed somewhat, and are better because of it. Noticed a few things that aren't as good (the game is easier, and it was already somewhat easy to begin with, the final boss has been made a lot easier), but overall this is the better game. Almost makes me want to get Sonic 2 GG to see if they changed the game as much from the MS version when it is inevitably released. ALMOST. I actually got Sonic 2 on the gamegear, with Sonic Pinball. I'll pick this up. I'm a huge Sonic fan. I've had this on Game Gear forever, but it's such an enjoyable game I'd like to experience it on a sharper screen. As many have mentioned, it's almost worth playing for the soundtrack alone. Great review Morgan. I passed on this one because I remembered hearing bad things, but on second thought I might have been thinking of the sequel. I'll grab this soon to tide me over before the 3D Classic Sonic. From an era when porting down was done with actual effort. It amazes myself at how close this 8-Bit game comes to a 16-Bit game. I have all 7 Game Gear games. I love the customization options for button mapping and full screen mode. Great Sonic game. Can't wait for Sonic 2 and Tails Adventures! I'm glad NL agrees with me that this is a little gem of a platformer! This is one of the best Master System/Game Gear games. No, but seriously, for those who haven't played this game before, BUY IT. You won't regret it. It's challenging, it looks & plays great, and most importantly, it's FUN. Still have my original Master System cart & downloaded on the Wii. But I still think I will download it again for 3DS. Hey it'll be portable now! Can't recollect rings? good thing we have save states! I'll pass on this one - I think Sonic 2 Game Gear is better, and I'm hoping it'll come out next week. The special stage and credits music in this game are out of this world. I await a review of the Shining Force game. I spent nearly two hours on it last night. Very entertaining so far. Looks like I've found out which Game Gear game I'm getting first. Sorry to go so off topic, but is it just me or does Sonic's left pupil look really weird in the title image? I played the Sonic Classics Collection edition, but I never ended up finishing it, so I might have to try this out. I am definitely getting this. It was the first videogame I ever owned or played. I had it built in to my Master System. Very excited! I love this game so much. No one really talks about it, or holds it in high regard as opposed to the Genesis titles. This was my first sonic game and I love it. The third boss in the game was my all time favorite boss in sonic games. I want this game so badly!! I NEED an E-shop card NOW!!! I know the Master System only really sold 15 million, scattered over Europe and Brazil, but at least give people that version of this game. @Pod The Master System version IS already available for download on the Wii's Virtual Console. Handheld gets the Game Gear version. Makes sense to me! @DarkCoolEdge You'll want to play the '91 Genesis/Mega Drive version if you want to "start at the beginning". True, it does. It's just a slightly amputated version in general, and the 3DS is fully capable of displaying the full SMS resolution. I guess this version does hold value in itself though, and some probably even prefer it for various reasons. @Pod Well with 240 horizontal lines and 400 vertical ones in 2D mode, 3ds could display most of SNES, megadrive and N64 games. Sadly, Nintendo isn't interested in that; except with some NES games. Ah yes, the Game Gear version of Sonic the Hedgehog. While I also have it through Sonic Adventure DX for GameCube, it just didn't feel right playing Game Gear titles on a big screen, which is why I downloaded the game last week on my 3DS. Graphics are amazing for an early Game Gear title, while the gameplay and controls still hold up well today. The 8-bit version of Sonic 1 was also the first game developed by Ancient Corp., a studio headed by legendary game composer Yuzo Koshiro (The Revenge of Shinobi, The G.G. Shinobi I & II, Streets of Rage trilogy, ActRaiser 1&2, Shenmue, Super Smash Bros. Brawl, and Kid Icarus: Uprising). Come to think of it, Koshiro also did a brilliant job with the memorable soundtrack. As always, Sega and M2's Game Gear emulations are top-notch with plenty of options for screen settings, customizable controls and restore points. It may be short, but Sonic the Hedgehog is worth downloading from the 3DS eShop.